Reading Time: 5 minutesLittle did I know that the 3 days I spent here at Blossoms Village Resort would be practically the last time for me to enjoy being in the lap of the Himalayas, before moving to Leeds to pursue my Masters in International Tourism. Somehow this trip wasn’t planned, it just happened, as I was busy backpacking across Vietnam and Cambodia in August and landed up straight in the lap of Himalayas before departing to Leeds. For starters, Blossoms Village Resort is a bespoke property located in the mountains of lower Dharamshala, but what sets this place apart is the Maitreya Study Centre. Maitreya Study Centre is a community organization offering a unique learning experience through its variety of courses which they keep running. You can learn salsa, pottery or even opt for a yoga retreat. It’s definitely one of the best places to consider for a wellness retreat, primarily because of its location (away from the chaos) and the beautiful surroundings. I landed in Delhi on 29th August, after spending the last 2 weeks travelling across Vietnam and Cambodia, and barely had I started packing for Leeds, I was on the road again, off the Mountains. After all, when the Mountains call, no matter what, that call must be answered by taking a trip. So, there I was, at the Dharamshala bus stop on the morning of 2nd September, waiting for my ride to reach Blossoms Village Resort. After 15 minutes of waiting and another 30 minutes in the cab, I was at the resort, which was my house for the next 3 days. The moment, I stepped inside the gates of the resort, the sight of the gardens, and the trees with the Dhauladars in the backdrop literally stole my heart away. Moments later, I was escorted to my room, which had a magnificent view of the mighty Dhauladhars. The room was way too luxurious considering the location of the resort. The room had a bathtub as well, which was the least of my expectation specially in Himachal Pradesh. Majority of my time was spent on my laptop, working, and at the same time enjoying hot yummy food with the sight of the mighty Dhauladhars in front of me. Apart from the Maitreya Study Centre, the resort also boasts an in-house restaurant, which doubles up as common breakout space during the day. You can get all kind of cuisines, be it Indian, Chinese or even Italian. The hot paranthas were anytime the best meals to start the day with. The chicken tikka masala, kadhai chicken were absolutely cooked to perfection, and the fresh tawa roti made the meal perfect. You should also check out the milkshakes, which can be ordered during anytime of the day. Once you are there at Blossoms Village Resort, you can practically step out to explore the Norbulingka Institute, which is a stone throws distance away, or even check out few cafes scattered around the area. The resort also acts as a concierge and helps you out with trips to McLeodganj, Bir Billing and even the Palampur tea gardens. McLeodganj is usually crowded all year long, but is popular because of the vibrant food culture. You should definitely check out the 24 hour McLeodganj food trail guide, and if time permits, a trek to the Triund ridge. Trust me, the sunrise and sunset from up there is purely magical. My most memorable moments during my 3 days stay at Blossoms Village Resort, would definitely be those, of having a hot cup of tea while witnessing the sun rise from behind the Dhauladhars. PS – No matter what, don’t forget to opt for a full body massage at Maitreya Study centre, as the massage followed by a steam and sauna bath, is sure to relieve your body of all the stress and tiredness, after a full day of exploring the nearby areas. Related : Dalhousie and its connection with Bengal. Like It? Pin It for Later ! No compensation was received for this article, however Blossoms Village Resort offered my stay complimentary. As always, the opinions on theETLRblog.com are (and always will be) my own! This post contains some affiliate links. So, if you were to book through these links, I would get a small commission at no extra cost to you. After all, I need to sustain my travels in order to create content.Thanks. All the Details which you mentioned about Dharamshala Blossom Village will be very helpful for the travellers who visit it. I totally agree for that and would like to contribute further to the users who are now reading this article. And you have transported me directly to Dhamashala. I have been to Mcleodgarj twice and absolutely loved my experience there. The mighty Dhauladhar range, hills, great food and humble people, the perfect place to seek solitude in the lap of nature. I really like the Blossome village resort and I would definitely love to stay there in my next trip to Dharamshala. I am sold out for staying in this blossoms village resort as it is full luxury surrounded by relaxing nature. I love mountains and greenery and so this place is meant for me. Another beautiful part of this place is, they offer pottery sessions, and I must not visit this place very soon. Rooms are spacious and well maintained. Thanks for sharing! The resort looks absolutely amazing with just the facilities one would love to have as well as those picturesque natural landscapes all over. I’d love to check it out when I am in the area, thanks for the recommendation! This resort looks amazing! The view is absolutely incredible. And I always like to stay at any place that has delicious food. The pottery class sounds interesting too. The Blossom village resort really sound amazing! What a great place to spend your 3 days to relax after a time backpacking! The pottery sounds fun to try, the room and the food look good. What I love the most about this place must be the nature. What a wonderful place to be! I hadn’t heard of Dharamshala until your post. I don’t know much about India, but Blossoms Village Resort looks like such a nice place to stay. That view from your large room is lovely! And I love that artwork on the wall of the pottery class! Blossoms Village Resort looks incredible, and really my kind of place to stay. I love the views surrounding the resort, so green and very inspiring too I can imagine. I’ve not ever been to India, and the Himalayas are one part I’d really like to see one day. I was already sold with the first picture from the balcony – wow, this place is fantastic! The room is beautifully decorated and I like the fact that there is a study centre where you can do lots of activities. Do you ever stop and just relax?! Vietnam to here to Leeds all so quick, you must have been exhausted by the end of it. Although saying that, this definitely seems like the kind of place to catch a breath and relaxation. That bed looks so comfortable – I have issues with beds in Indian hotels. I don’t think my European lumbar structure is used to how hard some of the mattresses are – but this one looks like it’d be great for a good night’s sleep. Well, this staycation was intended for nothing but relaxation and to get some blog work done, and that is exactly what I did ! I literally slept like a baby in the bed, and woke up to a gorgeous sunrise. Blossoms Village Resort sounds like an amazing place. And there is definitely no better place to learn some art than the Himalayas surrounded by mountains and valleys. The in-house restaurant looks like a perfect place to unwind with some delicious food on the menu. And while we are there we would love to do the McLeodganj food trail guide too. OMG, the food in this place looks amazing! Especially the milkshake part! Also, the view you had was breathtaking. I didn’t know much about this place before, but now I’m seriously considering it! Thanks for the review! Blossoms Village looks dreamy and like you could completely unwind here. Somehow, pottery seems like the perfect way to literally and physically reconnect with the land. There is also nothing like a full body massage to complete the relaxation process and reward you for getting out into the wild. This place looks absolutely dreamy! I’d love to see the Himalayas, but I don’t know if I’ll ever get there. Blossoms VIllage Resort is the perfect choice for a stay there, and looks very luxurious too! This is my kind of vacation and I definitely should go! Love that view from the balcony – it is so relaxing! The food looks so amazing too, which is always a bonus with that gorgeous and relaxing view. Oh what a view! And whilst the luxury level was perhaps unexpected it certianly sounds welcome – a hot bath in cool mountain climes? Yes please! How ineteresting that you can also head up here not just for sightseeing but pottery or salsa lessons if you feel so inclined – sounds very relaxing indeed! Your room is so spacious and looks like a haven for good rest, especially with the view from the balcony. I love the homey look of the restaurant, too. I can almost taste the chicken tikka masala which is a dish I love. I would love to go to this haven in the lap of the Himalayas! 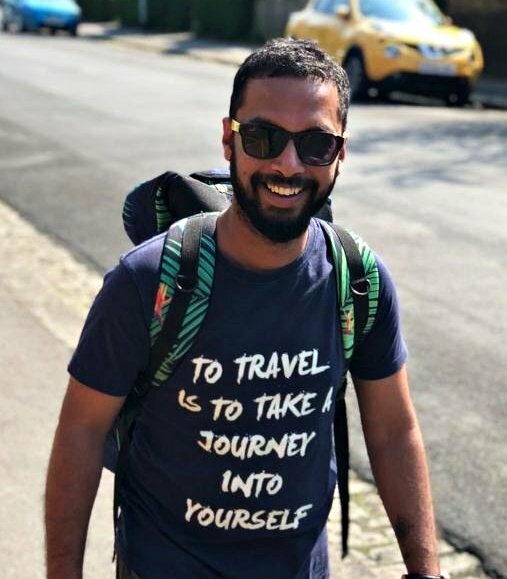 This looks like a digital nomad haven Arnav. Brilliant views from the room, with the lush mountains calling you. I agree fully; when mountains call, you must answer. Something about the elevation, and the over topography of mountains and valleys, that does something to your spirit. I love visiting mountainous areas; still recall my trip to Cusco, Peru among the Andes in 2013 like it was yesterday.